SIKU forestry harvesters, forwarders and tractors with forestry trailers soon finish work in the childrens playroom, but the timber still needs to be transported to the sawmill! Thats easy for the powerful MAN truck and trailer with forestry trailer! 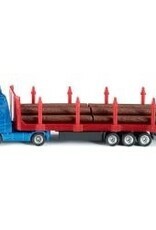 With front metal guard and side guards, the supplied load of plastic tree trunks can be safely transported. 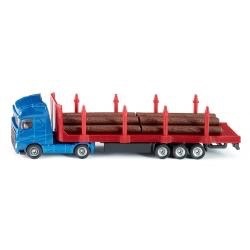 Model with rubber track tyres and truck wheel rims.